Australia needs its promised level playing field and a healthy, competitive telecommunications industry. 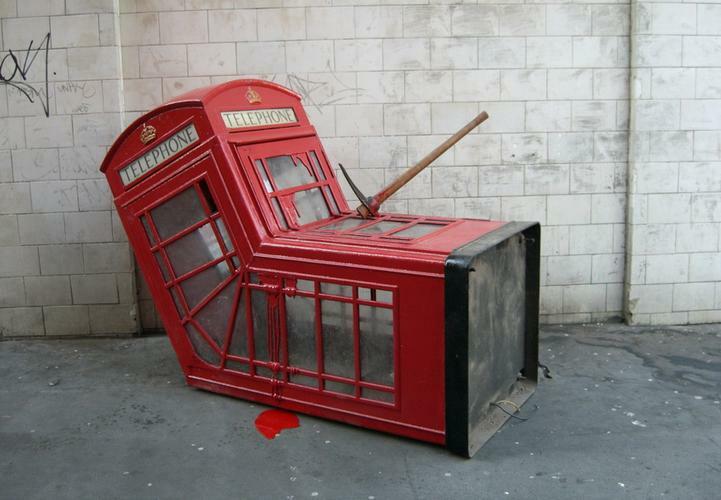 Booth by Banksy. Debate around the NBN has been re-ignited in the past few weeks with Tony Windsor re-entering the political arena to contest Barnaby Joyce’s seat and commenting, “It has to be Fibre-to-the-Home and I will fight to see that restored.” Also, this week at the Tech Leaders event in Sydney, Shadow Minister for Communications, Jason Clare made a speech focusing on the debate around technology and fibre versus copper. But in my opinion, though narrowing the conversation to the technology choices is missing the wider point around competition and costs. We at MNF Group have serious concerns for the future of our telco industry due to what we believe are fundamental issues with the NBN business case outlined in the NBN Corporate Plan for 2016. The key operational, financial metrics show that if it follows its current trajectory, the NBN model will reduce competition by squeezing out the mid-tiered telco companies and ultimately put a significant cost burden on to the consumer – thus, negating its original purpose and promise. Naturally, as a mid-size telco, we have a vested interest but to put this in context, our NBN related activity is just a small part of what we do. Our recent review of the NBN Corporate Plan shows that the ARPU (Average Revenue Per User) for NBN was budgeted to go from $33/user in 2016 to $42/user by 2018. When we extended the analysis to 2020 based on other statements made by NBN we found the ARPU across the NBN base was set to go to $63/user by 2020 – almost double 2015 levels. That is a CAGR of 14% over 5 years. Much higher than inflation, and somewhat at odds with our industry which has been used to offering consumers ever increasing value over the last 20 years. Add to this that a Retail Service Provider has its own costs – including the backhaul from the rather-excessively deployed 121 NBN Points Of Interconnect (POI) around the country, global IP transit costs, sales and marketing costs, customer service costs and ultimately the fact that we would like to make a profit. Using some very conservative modelling we established the average retail selling price for NBN services from a typical small to medium sized telco would go from $49 per month to $82.50 – for a 12 Mb/s plan, or $59 per month to $95 per month for a 25 Mb/s plan in 2020. Against this backdrop, you need to consider that four out of the five top-tier telcos have the capacity to bypass the NBN all together. Vodafone and Optus currently have 10GB SIM only plans at $49 and $60 per month respectively, so it isn’t unrealistic to predict we could easily be seeing 100GB plus of mobile broadband at the $49 price point. I also predict that those mobile broadband services will deliver peak download speeds well in excess of 12 and 25 Mb/s, more likely to be 100Mb/s. Then there is Telstra who has the biggest wireless network in Australia. Of course they are not allowed to compete against NBN but they can certainly compete with Vodafone and Optus so will be following a safe distance behind. Lastly there is TPG with their Fibre-To-The-Basement deployment. This has to be opened up to industry as a wholesale super-fast broadband service but even if it is sold direct by a TPG company brand, or through a wholesaler, it will also take away from NBN activations. So the question is – at what point will consumers stop bothering with a mediocre fixed broadband service and go mobile only? If the NBN does not meet its target of eight million activated premises by 2020, they will have a financial shortfall. That shortfall will need to be recovered from consumers who do use the service. Based on our modelling, if you look at the impact of NBN only activating 75% of its target households but still trying to recover the same revenue, the only choice it would have is to increase price – either by pushing up port costs or by recovering more from the CVC revenue. Either way the effect is the same: they will be forced to increase the per-subscriber NBN ARPU. The effect of that is that the subsequent new retail selling prices for a 12 Mb/s and a 25 Mb/s plan will go up to $82.50 and $127.00 per month respectively in 2020. This of course would escalate the decline in fixed broadband subscriber numbers, and push NBN further into the price rise cycle. Without some external intervention it could snow ball out of control and become financially nonviable. Throughout this, mid-sized telcos will simply be priced out of existence by the giants that have NBN bypass solutions and who can continue to offer price-competitive services through FTTB or 4G/5G wireless. But critically all consumers will lose out due to the lack of innovation and growth of an industry that has delivered so much over the last 20 years since deregulation. I believe we need a change before it is too late for the industry and consumers. If small and mid-sized players continue to consolidate as they get pushed out of the industry by poor industry strategy, there will be a serious reduction in innovation and choice. To save the Australian telecommunications industry – and I don’t believe this too aggrandised a statement - I believe the NBN model should be made more viable for the second-tier players in the telco industry who have a vested interest in seeing the NBN succeed. This should include a reduction in POIs and the removal of CVC usage-based costs that no longer reflect consumer usage patterns to allow healthy and effective market competition. Additionally, the government needs to consider writing off part of the NBN network build cost to ensure NBN retail pricing does not snowball out of control and remains competitive against NBN-bypass alternatives to allow NBN activations to gain critical mass. A fair model would allow middle players to step up and effectively compete in the market, driving NBN uptake and balancing out the challenge of the NBN-bypass services. Australia needs its promised level playing field, and a healthy, competitive telecommunications industry, for this ambitious network build to succeed. MyNetFone Group is an integrated telecommunications software and network provider, specialising in IP voice communications. The Group operates a global IP voice network carrying over six billion voice minutes per annum, with Points of Presence (POPs) in Los Angeles, New York, Hong Kong, Singapore, London, Frankfurt, Sydney and Auckland. Domestically, the Group operates the largest, fully interconnected IP Voice network in Australia. MNF Group companies include retail brands MyNetFone, Connexus, CallStream, PennyTel and The Buzz; and wholesale brands TNZI, Symbio Networks and iBoss. ​How sustainable are the tech industry’s hot jobs?